It’s strawberry season. Here’s a recipe that’s sure to please! 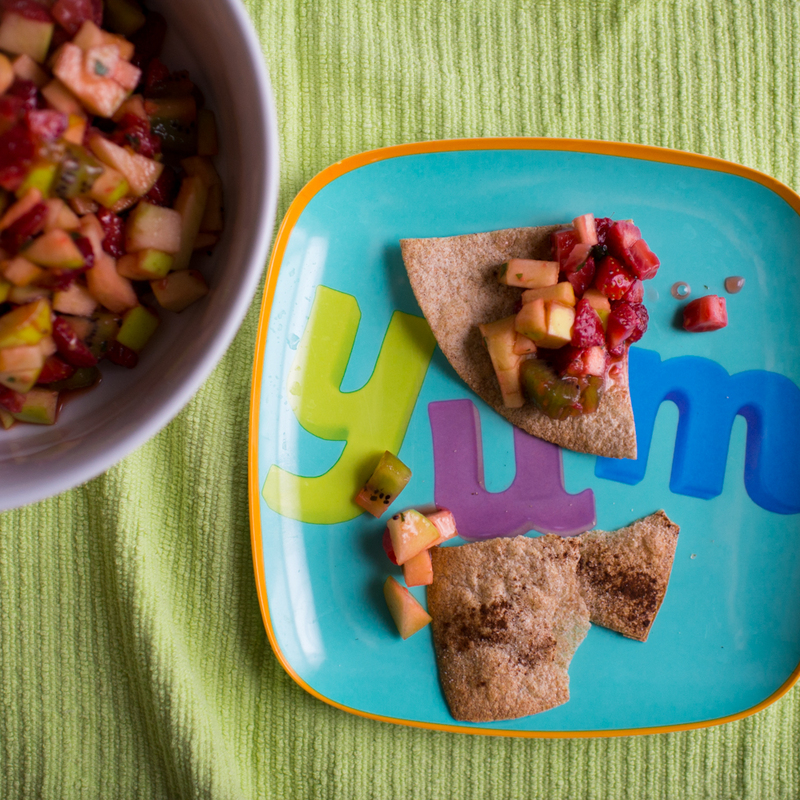 This is a sweet and minty take on salsa, using fruit. Strawberries serve as the base, and your favorite fruit ingredients can be added to make the taste more vibrant and the appearance more colorful. I made this with my Kids Cooking class and we even added starfruits and mangoes, which was extra YUM!! The chips can be made using your favorite whole wheat tortillas, or substitute a gluten-free tortilla chip like corn tortillas. Use the smallest dusting of cinnamon to add a little flavor to the chips. This is a great stepping stone to more savory salsas, once kids experience how fun it is to dip the chips!! In my opinion, you should not skip the mint. It really gives it that something special! Preheat oven to 350 degrees. Mix fruits, mint and preserves, cover and chill for at least 15 minutes. Brush one side of tortilla with oil. Flip, brush again, and LIGHTLY dust with cinnamon. Cut into wedges and arrange on large baking sheet. Bake 8-10 min in 350 degree oven. Remove and cool for 2-3 minutes. Serve with salsa.